Shoeboxed: Hi David! First, can you tell us a little bit about yourself? David Olsson: I am a recently retired attorney and law firm administrator. I am currently involved in managing several residential income properties. SBX: Between those two professions, we bet you’ve dealt with a lot of paperwork in your lifetime! DO: Absolutely. Between that work and a major remodel of my own home, I have a very frequent need to identify and review receipts. That is my top priority in a document management system. SBX: Let us guess: Enter Shoeboxed. How did you find us and decide we were the solution to your paper clutter? DO: I began to explore various document management systems a few years ago, while still working as a law firm administrator. I was interested most in ease of use—including the incorporation of document scanning—and in OCR, character recognition. I needed to get documents into the system quickly and easily, and be able later to retrieve documents by using OCR to search for text. I tried numerous solutions, including dedicated hardware, some expensive programs and services by big-name providers but none of them met my needs in any kind of satisfying way. I eventually opened a free account with Shoeboxed and almost immediately upgraded. I feel like Shoeboxed finally fills the one hole I have had for a long time in my information management system. Now when I have to find a document, say a maintenance receipt to determine which property it relates to, I can do so quickly and easily—and from anywhere that I have internet access. SBX: We’re thrilled that Shoeboxed has completed your organization toolkit! After all, our service was built for the busy and the stressed individuals out there. What’s your favorite stress-buster or way to spend your free time? DO: My advice for relieving stress is to always capture on paper or electronically any item that you might later worry about. That’s the core of the Getting Things Done system, by David Allen. I find that Shoeboxed helps me a lot in working the GTD system. There are lots of things I like to do when I get a bit of free time. 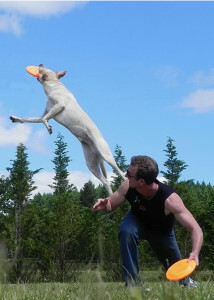 My favorites are probably playing volleyball and doing canine disc with my dog, Dodger. My wife and I are also dedicated ballroom dancers. SBX: It sounds like you live quite an active lifestyle, which means you probably like to spend as little time as possible on tedious tasks like taxes. DO: You’re right. Having just filed my taxes, I can tell you it was wonderful to be able, with a few keystrokes, to find any receipt in my files. I no longer have to comb through stacks of paper, of various sizes, to find the details of any transaction. SBX: That’s music to our ears! We can tell you love organization as much as we do. What’s your top tip for other Shoeboxers trying to get organized? DO: Try a combination of Shoeboxed, Gmail and a task manager like Nirvana. Together, they provide a valuable system for capturing and organizing the many details of a busy life. SBX: Thanks, David! We appreciate you sharing your wisdom with us and are so glad you’re a Shoeboxed user.